In 1984, Croatian artist Mladen Stilinović stated in his book Footwriting, ‘there is no art without consequences’. The consequences, then, of his 40 year career deserve closer examination. Indeed consequence or, perhaps more precisely, context is key to understanding not only the breadth of his practice but also the development of his methods. Stilinović has lived and worked in Zagreb, the capital city of present-day Croatia, for most of his career. Between 1943 and 1992, the country was a part of the Socialist Federal Republic of Yugoslavia, and the socio-political constraints of the region and its turbulent history play a significant role in his practice. While Yugoslavia enjoyed more individual and cultural freedom compared to its Eastern Bloc neighbours (with a highly active experimental film scene during the 1960s), the government’s official rhetoric was socialist. Under this political regime, the artist and his peer group engaged in a dynamic working relationship with their complex surroundings. In the late 1950s, a group of artists calling themselves ‘Gorgona’ reacted to the burden of Yugoslavia’s dominant form of art—Socialist Realism—as well as the 40 year lineage of Constructivism and the Russian avant-garde as a style of graphic and ideologically-imbued communication. Based in Zagreb, Gorgona—whose founding members included Josip Vaništa, Julije Knifer, and art historian and artist Dimitrije Bašičević-Mangelos—actively produced art works from 1955–1966 through a variety of means, including street actions, postal mailings, and the production of an ‘antimagazine’ titled after the name of the group. Gorgona sought to extract itself from the mediating forces of galleries, museums, and critics, who were, until then, the requisite for acceptance into the circles of Yugoslavian art and its institutions. In 1975, the Group of Six Artists formed (sometimes referred to as ‘Authors’). Its members included the 28-year-old Mladen Stilinović. Group of Six took up the previous agenda of Gorgona, and aimed specifically at initiating direct contact between artist and public. The group worked externally to museums and galleries and organised actions in urban locations that ranged from university campuses, to town squares, and even beaches. Then radical engagements with a specifically non-art community included setting up tables in a public centre, and inviting passing pedestrians to view and discuss books made by the group and its members. Two members of Group of Six, Stilinović and poet Vlado Martek, began inscribing their poetry and various other experimental languages across non-traditional materials, such as notebook paper, leaflets, posters, graffiti, photographic paper, receipts, plastic bags, mirrors, and enamelled plates. Their unconventional use of materials tested the expectations for the space of poetry and art. To exercise this agenda, Group of Six initiated its own serial publication, Maj ‘75, which was titled after the month and year of the group’s first street action. Using a simple A4 format, Maj ‘75 comprised individual artworks. Seventeen issues were published between 1978 and 1984, each edition plainly indexed by letters of the alphabet. From that era to the present, issues of Maj ‘75 are nearly impossible to find in their entirety. 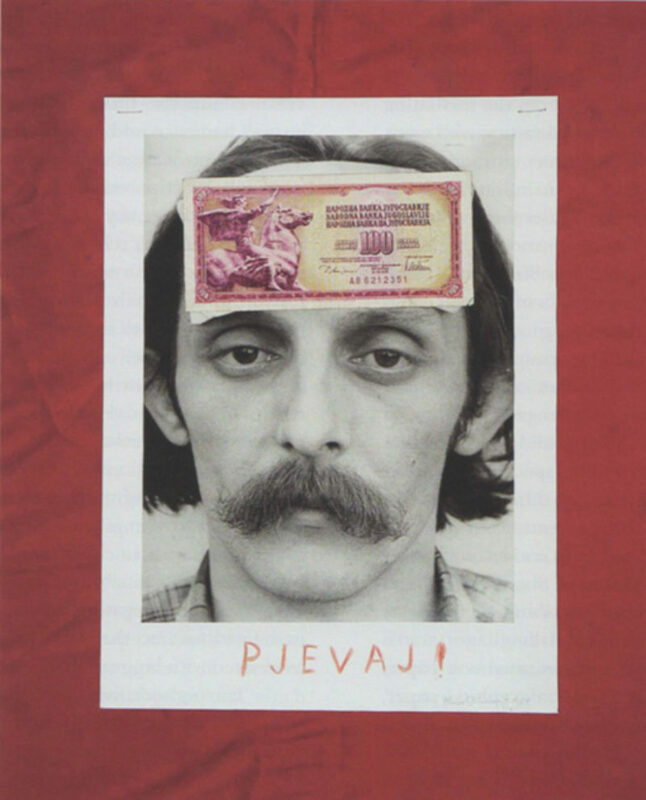 As artists working outside of the conduits then considered relevant in Yugoslavia, the Group’s limited audience and distribution opportunities contribute to the rarity of the publication. In 1973, he made one of his first book editions, They Spoke to Me to You . The pressure to create commodity-linked editions was absent, due to a small audience and limited distribution channels. Thus Stilinović was relatively free to experiment without restriction on the duration, or material, of production. Like Maj ’75, he produced his publications on A4 paper, releasing them in editions of up to 20. They drew from what had become a familiar lexicon of materials both in his individual and collaborative practice: taped photographs, leaflets, clippings, and other ephemera. Stilinović’s early work exhibits a propensity towards the deconstruction of language and the effacement of its ideological connotations. The origins of such investigations are apparent in his books focusing on photography, such as Photographic Book 100%, 1975, a compilation of overexposed photographs that, without subject, depict nothing but the mechanisms by which an image cancels itself out. This strategy of negation anticipates his subsequent investigations into the subversion of the symbolism associated with language. “savez kommunista” to “savez komunista”, thus “league of socialists” turns into “common nothing”.’  In this compromised atmosphere, the artist also found the possibility to study the construction and dismantling of the language used for the ends of political propaganda. His 1975 book, 1 May 1975, is a re-presentation of state signs observed in the urban environment; across its pages are a tight configuration of images depicting slogans on billboards, on trees in city parks, and other locations throughout Zagreb. Seeing each sign and phrase stacked next to each other overwhelms the reader, thus serving to deflate the announcements of their intended meaning and manipulation. In Have a look!, 1974, and Watchers are asked, 1974, meanwhile, the page displays verbal commands juxtaposed with found materials such as gauze or clothes pins. Stilinović’s insertion of foreign bodies, in place of the statement, demotes the power of the slogan and suggests that, without the aid of graphic design, these previously commanding phrases fail and are instead absurdly recast. Without formal art education, the artist’s family and immediate circle were nonetheless intellectually active, and Stilinović was an avid player in experimental film circles in Zagreb. Interested in literature, poetry, and art, by linguistic theorists Mikhail Bakhtin, Roland Barthes, Jacques Derrida, Ferruccio Rossi Landi, and Danil Harms,  Stilinović’s subsequent efforts reflect his ongoing endeavour to empty out the conventional and ideological associations, not only of language, but also of colour. 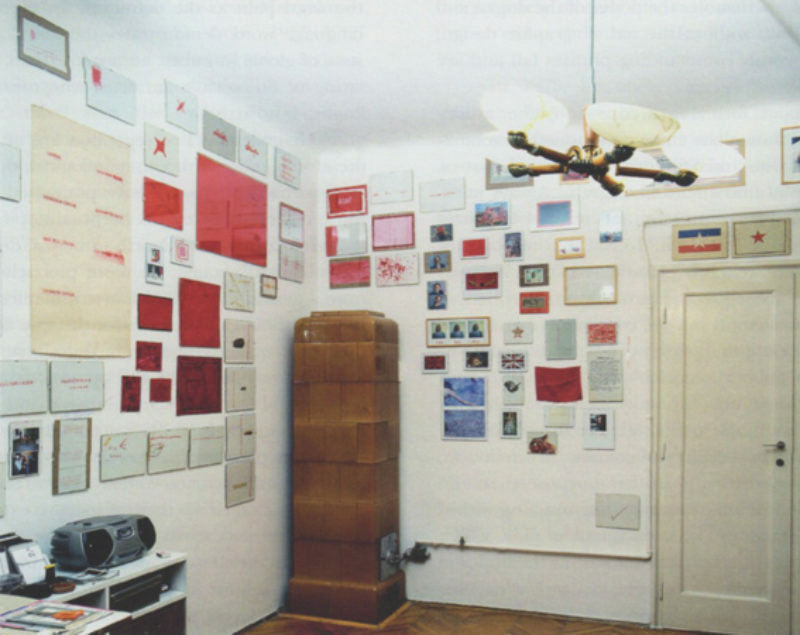 In publications, Little Red Book, 1978, and Written in Blood, 1976 (a handwritten text inked with his own blood), the artist ‘reclaims’ the colour red. Reinscribing its socialist and communist symbolism, Stilinović uses it for no other purpose than the construction of an artwork, and its function within the artist’s palette. The same is true of pink, which he calls a ‘bourgeois colour’, and thus the opposite of red. 5 For An attack on my art is an attack on socialism and progress, 1978, which appropriates the political slogan, ‘an attack on the heritage of the Revolution is an attack on socialism and progress’,6 he used red ink to silkscreen the title across the booklet, which comprised sheets of pink silk instead of paper. As such, the two opposing colours clash, annulling their respective political references. The tactile experience of Stilinović’s books is just as significant as their visual appeal. ‘I think it is pointless to show books if you can’t turn the pages’, he states. In particular, Foot—Bread Relationship, 1977, appeals for its interaction between author and reader. The concertina pages unfold to reveal a series of photographs that, when viewed in sequence, animate the artist’s foot kicking a loaf of bread against a wall. Dictionary-Pain Pain (1979/1980) also uses a similar strategy of repetition. Printed in two different language editions (Croatian and English), the definitions of all the handwritten words have been erased with white-out and replaced with the word ‘pain’ (or ‘bol’ in Croatian). Stilinović decided to print an edition in English in order to call attention to what the artist declared as the dominant ‘language of globalization’. The repeated use of the word pain as the definition for every English language word demonstrates the literal pain of a state of global linguistic homogeny. 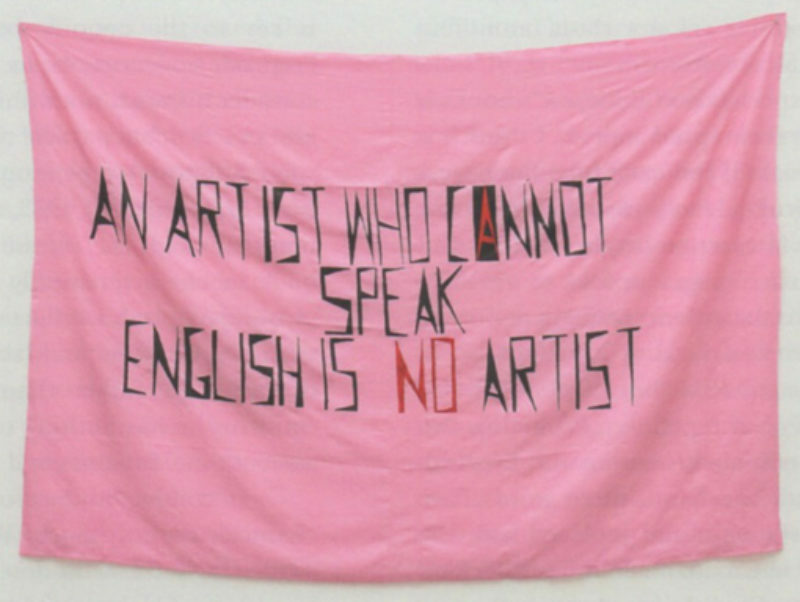 Thus, a famous saying of Stilinović’s: ‘an artist who cannot speak English is no artist’. His mechanics of repetition are often, as in the aforementioned book, tautological; thus, many assessments of the work have positioned it within the territory of formal conceptual practices in Western Europe and north America during the 1970s. But in context, he more precisely emerges from a generation of Croation artists referred to as ‘new Art Practice’, the term for the style of conceptual and post-conceptual art in Yugoslavia. Though there is a compositional and operational similarity between the tautology in his work and the self-reflexive devices used by conceptual artists of the West— oseph Kosuth, Art & Language, Bruce Nauman and Lawrence Weiner come to mind—the conditions that drove these respective experiments were not necessarily the same. Where the production of the latter is set against the backdrop of pervasive advertising in the 1950s and 1960s, Stilinović’s statements address and reflect the Yugoslavian state. The artist noted the use of repeated slogans in the public environment was ‘torture’—something that ‘turned into a part of everyday life, whether we want it or not’. This political and cultural circumstance is key to the enquiry behind his material and linguistic concerns. As such, it is more accurate to consider his work, not within the realm of conceptualist practice, but parallel to it. Stilinović’s repetition of the title phrase in the book I Have No Time, 1983, demonstrates this distinction. Although the phrase repeats throughout the book in characteristically tautological format, the phrase is a playful reflection on the socialist situation, wherein time and labour become valid forms of exchange, rather than capital. He repeatedly confirms he has nothing to exchange; he lacks the asset of time, fundamental within this context. In contrast to the clean and simple formalism characteristic of much Western conceptual art, interestingly, the artist describes the method behind his choice of materials as ‘messy’,  part of his ‘dirty minimalism’. His books are nearly all compiled by hand,  and often include his own handwriting alongside typed text, newspaper clippings, pasted photographs, finger prints executed in series, and even a taped film strip. The seams of construction are visible, and reveal glue marks, staple binding and uneven cuts in the paper. Such manufacture is susceptible to misinterpretations that the work is naïve in some way, and Stilinović is wary of the way in which art historians often seek to place his practice within the scope of Arte Povera. By contrast, he perceives Arte Povera as a rudimentary reaction to the visual,13 while he views his work as a reaction to language, deflating symbolic associations. His materials and fabrication methods are not symbols of poverty; for him, they are merely arbitrary. These are the available materials so he will use them; they stand for nothing more. The books do not have a design or visual strategy. They sit, not in opposition to high design and production, but outside of it. After 1992, the socialist government of Yugoslavia was reformed as the Republic of Croatia. Despite this break, Stilinović continues to address the social conditions that surround him, most notable with Cynicism of the Poor, 2001, and Exploitation of the Dead, 1988–2007, two books which address the images and symbols associated with poverty and hunger: bread, potatoes and cake. This recent work marks a shift from his interest in the rhetoric of newspapers or street signs to the art historical, as he reassesses the paintings of Kasimir Malevich, a figure with whom Stilinović has engaged throughout his career. While Sing!, the recently-opened retrospective at the Ludwig Museum, includes over 40 of his books. Stilinović and his artist peer group radically reconsidered the materials and spaces of art making and presentation within the constraints of their political and cultural system. The knowledge that these constraints have informed his oeuvre is key to relating to his publications in the present day. With this in mind, his earliest and most important objectives emerge as the following: make art that can cohabitate, or even integrate with, the everyday; the place for art can be anywhere; and an artist, despite any of the elitist allusions that the archetype may imply, can be anyone. 11] Branka Stipančić and Mladen Stilinović, op cit.